Our previous note mentioned about volatility (INDIA VIX) remaining at one of the lowest values in recent times. Wednesday’s trade saw volatility making a comeback as the NIFTY saw itself oscillating in a 60-points range on either side before settling with a nominal loss. The NIFTY50 Index ended the day losing 21.30 points or 0.20%. The Markets consolidated but at the same time remained quite volatile. We expect this volatility to spill over into Thursday’s trade as well. Though the start to the trade may be uneventful on either side, we will see the Markets consolidating with the levels of 10785 acting as immediate resistance area. In the next session, the levels of 10760 and 10785 shall pose resistance to any up move while supports will come in at 10680 and 10650 zones. The Relative Strength Index – RSI on the Daily Chart is 67.7129. It remains neutral against the price showing no divergence. The Daily MACD stays bullish trading above its signal line. On the Candles, a black candle emerged. This has occurred near the upper Bollinger band and this typically stalls an ongoing up move. 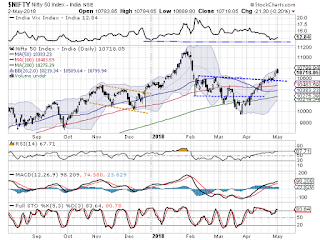 Pattern analysis reveals that after breaking out from a rectangle formation, the NIFTY is consolidating at higher levels. Though some retracement from current levels should not come as a surprise, presently it has continued to consolidate in a capped range. Overall, as we approach trade on Thursday, if we see such consolidation continuing, it should work out to be healthy for the Markets. Some shorts have started to get build up once again as we are seeing NIFTY premiums getting reduced by nearly 25-points. We expect the levels of 10785 acting as resistance for the immediate short term and expect the Markets to oscillate with limited downsides. We recommend avoiding shorts and utilizing downsides, if any, to make select purchases. Volatility too is likely to remain ingrained in the Markets. Overall exposures should be kept moderate while maintaining a cautious view on the Markets. Short positions were seen being built in HINDZINC, ICICI BANK, IDEA, ASHOK LEYLAND, MARICO, POWERGRID, NCC, TATA POWER, CGPOWER, ENGINERS INDIA, IGL, TVS MOTORS and COAL INDIA.